Bush fires are ringing the township of Mt Thomas and Maggie and Wayne are out evacuating farm houses in the path of the inferno, but this routine job suddenly turns dangerous when they are confronted by a masked man brandishing a shotgun. 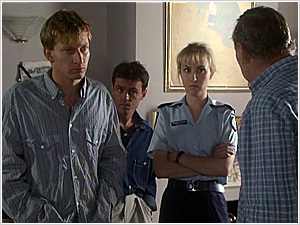 Maggie and Wayne overcome the offender and take him into custody. Back at the station he is quickly identified as one of three bandits who held up the St. David's bank the previous day. The prisoner proves to be uncooperative. He refuses to give his name or those of his accomplices and in an unguarded moment, he swallows a handful of thumbtacks. Although Mt. Thomas Hospital is presently under renovations, there is still a skeleton staff there and the bandit is rushed into emergency surgery under the care of Dr. Zoe Hamilton. At the hospital, Wayne is duped into giving up his gun and uniform to Jason and Nerida, the two missing bandits. 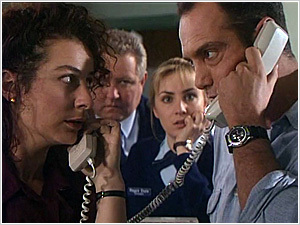 When Maggie goes to the hospital and discovers someone else in Wayne's clothes, she plays it cool and attempts to put a call through to the station, but as soon as she makes contact the power and phone lines go down and the Heelers fail to get the message. Maggie's next move is to try and the escape from the hospital, but the bandits already have Bobby, the hospital's maintenance woman, moving around the building dead-bolting all the doors — nobody can get in or out. Dr Hamilton is surprised to find her operation interrupted by gun-wielding bandits wanting to take her patient away, however, she bravely faces them down, pointing out that if they take him now, their friend will die. Maggie locates the bound and gagged Wayne in the hospital generator room, but unfortunately so does Nerida who also takes Maggie hostage. Having previously taken the precaution of slipping on a white coat, Maggie poses as Dr Margaret Blake. Back at the station, Adam and Nick are called out to the Purvis farm where Keith Purvis has trapped an arsonist. While protecting the man from an infuriated Keith, Adam sustains a burn to his hand and is taken to the hospital for first aid. 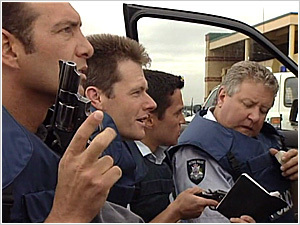 On seeing Jason in police uniform, Nick and Adam naturally assume that it's Wayne. They get an unpleasant surprise when the uniform draws his gun and fires at them. The bandits decide to make a break for it before Nick and Adam have the chance to call for reinforcements. As they get to the front door, their sick colleague regains consciousness, sees Maggie and immediately identifies her as a police officer. On hearing this, Jason prepares to kill her on the spot. Notes: Seven moved the series 3 debut to Monday night to compete against the double episode series premiere of Water Rats on Nine. The opening credits no longer include the featured guest actors and the episode title and production credits now come after the opening sequence. A siege has developed at the Mt. Thomas hospital. While the armed and desperate Nerida Davidson and Jason Bennett hold Maggie, Wayne, patients and staff on the inside, the rest of the Heelers lie in wait outside, and with bushfires ringing the township, outside help a forlorn hope. The bandits' objective is to get their compatriot, Matt, out of the hospital and away, but this is not made any easier by his gradually worsening medical condition resulting from having swallowed a handful of thumbtacks in order to get to the hospital, a soft target from which he could be more easily rescued. The situation is further complicated by the presence of mother-to-be Augusta Torrini and her emotional, hot-blooded husband, Sergio. When Wayne bravely tries to overcome the bandits he ends up pistol whipped and chained to a hospital bed. Maggie, Dr. Zoe Hamilton, and nurse Tracy Mitchell play a dangerous game of bluff to try to and get Augusta to safety. Adam, meanwhile, comes up with some disconcerting information about Jason. It seems that as a teenager he quite literally got away with murder. Zoe prevails on the bandits to set most of their hostages free, but they insist on keeping Wayne, Tracy and Maggie. Nerida is desperately frightened for her sick brother and seems amenable to good sense, but the psychopathic Jason has quite different ideas. Communication between the bandits inside the hospital and the police outside is made more difficult when Jason has a fit of temper and smashes Wayne's two-way radio. As the fires rage outside, the situation in the hospital becomes more and more tense. Cut off from outside help and with Wayne bound and unconscious, Maggie has to fall back on her own resources. She tries the psychological approach and discovers that Nerida and Jason are a couple of disaffected private school kids, yuppies who are trying to set themselves up for life with a "once-only withdrawal" from a bank. Jason aims to get out of the hospital back to the hobby farm where they have stashed the loot from their bank job. Maggie tries to counter this by threatening the imminent arrival of the SOG ("coppers from hell"). The resumption of power supplies, however, enables Jason to discover the real situation. The town is cut off and there is little chance of the SOG, or anybody else, getting through. 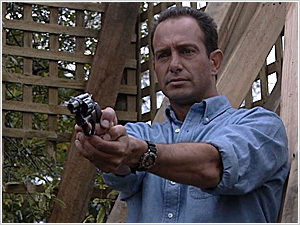 Jason decides to go while the going's good and there is nothing the Heelers can do to stop them. Meanwhile, isolation proves to be a problem for Augusta as lack of transportation forces her to have her baby in Tom' office at the police station. A baby boy is delivered by Zoe Hamilton, using Chris and Adam as midwives. Nerida and Jason make their way back to the hobby farm, but not before personal tragedy and unforeseen circumstances intervene. Cricket team rivalry, stolen meat, and suspicious fingerprints. Could all this lead to the capture of a wanted criminal? The prime suspect in a series of child murders is found dead under mysterious circumstances while in police custody and Nick, haunted by memories of his daughter's death, becomes a suspect when he shows little or no remorse for the man's death. 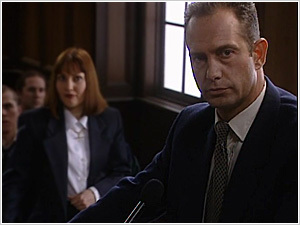 At the Coroner's Inquest, Nick learns that he is the prime suspect in the death of a suspected child killer who died at the station while in Nick's custody. 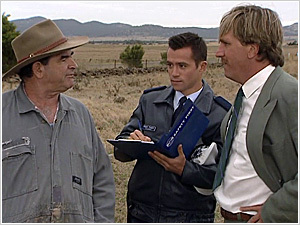 When the Heelers are called out to a nasty road accident they are shocked to discover that one of the injured is Adam Cooper. What exactly was he doing in a car that appeared to have been drag racing and what else is he hiding from them? Plans to build a high-security prison for the criminally insane in the area have the locals up in arms. Tensions in the community run high and the local cops are accused of colluding with the demonstrators. Tom creates a monster when he encourages an elderly, civic-minded school crossing supervisor and has to deal with explosive consequences. Wayne becomes involved with a local schoolteacher after her son goes missing. Note: Nikita Plummer (the little girl almost run over) returns in series 6 in the reoccurring role of Emma Stewart, one of Ben Stewart's (Paul Bishop) daughters. There's a sheep killer in the area and fingers are pointing at local dogs, Tom's included. With rumours about the mythical Mt Thomas Puma wandering the countryside, the Mt. Thomas cops are determined to hunt down the animal responsible. Meanwhile, Wayne plays the field at home. Wayne's life is in danger when a violent criminal escapes from prison and heads for Mt. Thomas. Wayne's death upsets the police officers of Mt Thomas deeply — as does their exclusion from the funeral service at the request of his parents. 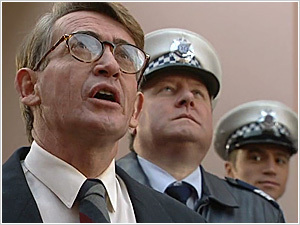 The discovery of a stolen watch among Wayne's possessions forces the Heelers to clear their dead colleague's name. Maggie celebrates her 25th birthday but the fallout from a drug bust threatens to tear her family apart. Tom receives a surprise visitor at the station. 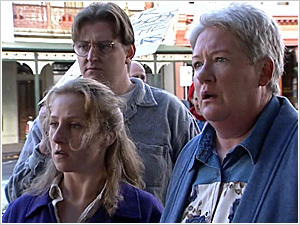 Notes: the only episode in which Maggie, her father, and two brothers all appear together (and David Wenham's only appearance as Robbie). The first appearance of Tom's daughter, Anna. After series 3 we don't see her again until series 12. Inspector Faulker fills in for Tom when he is sent away for a training session, leaving the station seriously understaffed. Things go from bad to worse when the computer system goes down, an old man goes missing, and a young mother's car is stolen with her baby asleep in the back seat. Nick and Adam are preoccupied by a pesky car alarm and Faulkner dismisses a young man who comes into the station looking for recruiting info. Wayne's replacement finally arrives in Mt Thomas, just in time to help the Heelers deal with a rodeo cowboy who seems to be sending his young son out to steal for him. Tom anxiously awaits the birth of his first grandchild. 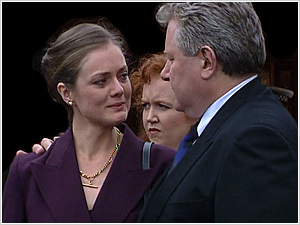 Note: Suzi Dougherty (miscredited here as Suzie) returns in series 6-9 as Dr Mel Carter. 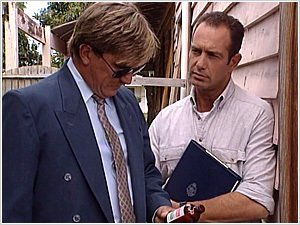 PJ and Jack Woodley are at odds over how to handle the case of an elderly police widow who is the victim of a vicious assault. When a shearing competition goes horribly wrong, PJ starts his own investigation and his results lead him to the conclusion that his new partner, Jack, planted evidence. The search is on for a name for Anna Croydon's baby. Maggie is set to prosecute the Dean Crocker case but PJ has doubts about the investigation and is forced to make a difficult choice when he finds proof that Jack has falsified evidence. Adam and Jack investigate a series of pump thefts. The Mt. Thomas Festival of the Arts causes headaches for Tom and Chris. Nick attempts to break down the fence between two feuding neighbours and PJ searches for a grow op. Maggie investigates a homicide on the sly, and Adam deals with a complaint from a high school principle about the circulation of pornographic material in the area. Note: this murder-mystery episode was written by Jennnifer Rowe who would go on to co-create (with BH co-creator/executive producer Hal McElroy) and devise almost all the stories for the successful series Murder Call which would debut the following year. Adam succumbs to the stress of the job when he and Nick discover the body of a teenage boy who died during a drunken dare. Following Chris' summary dismissal of her cellarman after complaints to the police of selling to minors, the rest of her staff at the pub go on strike. 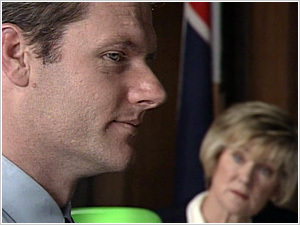 Nick runs in the election for the Police Association. The new Probationary Constable, 19-year-old Dash McKinley, arrives in Mt Thomas much to Tom's annoyance and Adam's delight. Meanwhile, when a young woman turns up to confront a wealthy Mt Thomas family with the news that she is a long-lost daughter returned from the dead, the Heelers are faced with finding a solution to an unresolved crime from eighteen in the past. Tom is faced with a dilemma when the attempted suicide of Clancy's mother places the future of her intellectually handicapped son in jeopardy. PJ and Maggie must examine the events of the past to solve an allegation of child abuse when a woman unleashes some recovered memories from her childhood. Dash and Adam work to identify an assault suspect with no clues other than a blind man's desciption of the offender. Dash and Nick are called out to an old farmhouse where they discover a vandalised room, a terrified child, and swinging from a light fitting... a dead lamb. Despite earning a commendation for her actions, Dash's behaviour continues to antagonise Tom. Note: this episode aired against the Atlanta Olympic Games Opening Ceremony. BH went on hiatus for two weeks during the games. Maggie's deepening relationship with her university tutor creates sparks with PJ as they investigate the disappearance of a young ballet dancer. Tom suspects an itinerant water dowser of being responsible for a series of bashings, the latest which has put a paraplegic farmer in hospital. Little does Tom know, however, that the stranger is the father of Anna's baby. Adam makes a sacrifice for charity. Nick is surprised by Dash's unprofessional behavior at the scene of a fatal accident, only to later learn that both victims were friends of hers. She insists she can cope with the trauma, but Nick feels there is more to it. When he does some investigating into Dash's history, he discovers a secret. PJ investigates Maggie's tutor, Roman, and discovers he's married. The Heelers search for a car vandal. Nick and Adam are called out when a group of wild-eyed religious bigots attack the home and property of full-time hairdresser and part-time witch, Siobhan Kennedy. PJ spills the beans about Roman but an investigation into the death of a clergyman's daughter leads Maggie to wonder how much he really knows. Note: John Banas wrote 39 episodes of BH, winning an AWGIE Award for episode 4.05. As Tom accepts the possibility that his daughter is gone for good, the team investigates a possible child abuse case and Dash is very taken with PJ's replacement. Tom thinks he's found a suitable crèche for his grandson Sam — until rumours of baby bashing start to circulate. A crime at a winery gives Johnny Kowalski the opportunity to make a move on Maggie. Meanwhile, Dash gets a humiliating rejection and Tom hears some news which gives him grave concerns for the safety of his missing daughter. Intent on buying a car but short on cash, Dash turns to Chris' new gaming machines then gets carried away by her winning streak, losing Adam's nest egg and putting pressure on their friendship. The Heelers investigate a domestic burgularly. A prestigious horse endurance race presents problems for the Heelers with both a sabateur and a thief on the loose. Dash and Maggie can't escape Johnny Kowalski's womanising and the team face PJ's return with mixed feelings. 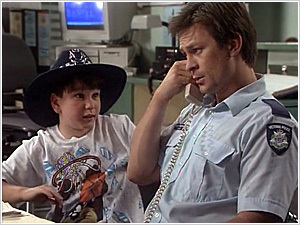 PJ is too busy for an apology from Maggie after a toddler calls the station and says his mother won't wake up. While PJ talks to the child, the rest of the Heelers work to try and determine his identity and location using what little information they have. Dash and Adam wreck the hard drive of the computer at the station while playing a game. They have the system quietly repaired locally and are anxious that Tom doesn't find out, but glitches soon appear, which seems to be connected to a puzzling series of break-ins Maggie and PJ are investigating. 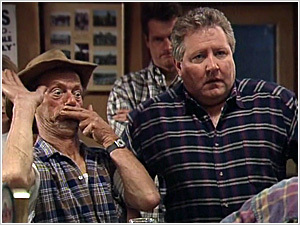 Note: Peter Felmingham makes his 3rd appearance as security guard Bob Campbell but is credited as Peter Paulsen. He also was credited under both names (as well as Peter Pawlsen) on Prisoner. The return of a young criminal to Mt. Thomas stirs up painful memories for Dash. Nick and Adam are sent to a domestic in which PJ becomes the target of a family's rage against the police. When a young mother of two is killed, a videotape of the incident appears to show that PJ cold-bloodedly shot her in the back. PJ faces tough questioning but the worst attention is that of tabloid TV journalist, Paul Carson. Maggie can see that PJ is having a harder time than he lets on, so she decides to help clear his name in the media. To do this she must prove that video pictures can lie and that Carson is a fraud. But even if she succeeds, PJ still has the Coronial Inquest ahead of him. It's Halloween in Mt. Thomas and when Dash and Adam are sent out to apprehend what they assume is a seasonal prank, a naked man painted blue, Dash is astonished to discover it is her brother Ian, the victim of his bucks party the night before. Ian's wedding is only two days away and Dash is horrified to discover his fiancée in bed with a German tourist. But Ian is prepared to overlook her indiscretion and ignore warnings from Dash. Can Dash change her brother's fate in time? Nick is delighted when his old friend Gordy Muir turns up in Mt. Thomas to run a stress management "war games" course for corporate clients and thrilled when Gordy offers him a partnership in the new venture. 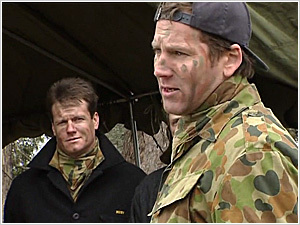 But things quickly go sour when the observing senior partner of a law firm is injured during a mock ambush on the paintball course, and the Heelers are called in to investigate. PJ's career hangs in the balance when the Coroners Inquest into Raelene Darcy's death begins. PJ suffers a crisis of confidence and only Maggie stands between him and professional ruin. A death-bed confession raises question about a conviction in another of PJ's cases from early in his career. The favourite in the Miss Mt Thomas contest tells the Heelers she is being stalked, then mysteriously disappears while under the protection of Dash and Nick. 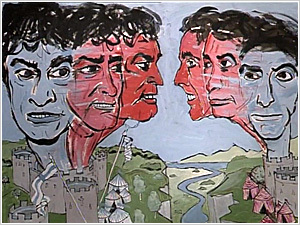 Guest Starring: Susan Paterno as Debbie De Laurien, Stephen Hayden as Daryl Sinclair, Christopher Barry as Ron Marsh, Christopher Lee as Richard Elliot, Robyn Whyman as Sandra Marsh, Audrey O'Carroll as Baby Sam, Axl Taylor as Len the Barman. Dash's family problems reach a crisis point when her mother is admitted to a Melbourne hospital. She is in desperate need of a donor kidney to save her from certain death. But when advised of a possible donor, Dash's joy is short-lived — the donor is her brother Ian who has been in a motorbike accident and is not expected to live. The girlfriend of an escaped prisoner makes a desperate attempt to keep him out of prison but his escape has much greater consequences, particularly for Dash. Anna's sudden return is bittersweet for Tom.